The mini-pita breads have long been a favorite for F&B. Mini food, of course, is much more fun than regular sized food, and they do provide some other good sandwich options, especially with messier fillings. They also make a darn good taco shell for leftover taco meat in lunches. Faith has a couple of mini pita tacos (leftover turkey taco meat and some kind of marble cheese since I ran out of shredded taco cheese). To go along with that meal, she has carrots, a few cucumber flowers, strawberries, and some peach yogurt, all packed in a 4-square Lock & Lock box. LOVE this idea! I've never seen mini-pita bread before, I'm assuming I can can get it at a regular grocery store? I get it at Kroger (Dallas area). It's in the bakery section with the regular pita breads, packaged, not baked in store. The one we buy is "Toufayan". Ooh, love this! I have some of those mini-pitas in the freezer and we had tacos last night. 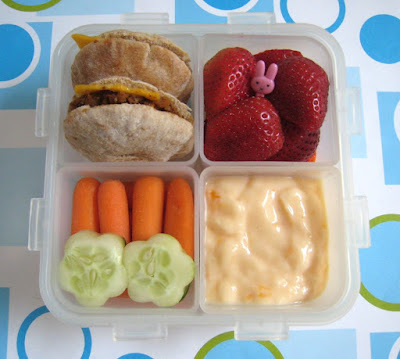 I was thinking to myself, the taco fixings would make a great 'lunchable' type lunch for my kids. Will have to try it--thanks! So funny I just finished my lunch from a box just like that. I'll have to get the mini pitas for my daughter's lunches. Good idea! Where'd you buy the box it's in?!?! I love this idea for my daughter. Have to look for the mini pita breads here. Love the mini pitas, so perfect for a taco lunch! Those mini pitas are the cutest. You're right that mini food is much, much better than regular sized food. Mini food is also less daunting for kids - they don't necessarily want to commit to eating a whole bunch of something they might not like, but a tiny serving is like a promise that they only need to try it! I'll bet your kids are very good eaters as a result of all this tiny cuteness. Mini food rocks. It is how I have convinced Audrey to try tomatoes again. We purchased a container of local, mini tomatoes and she keeps telling me how much she loves them.